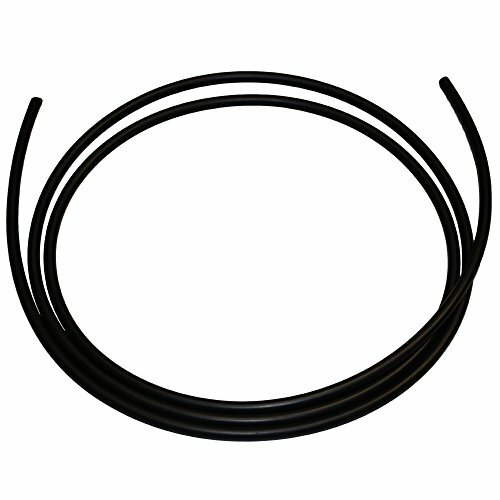 This O-ring cord is made of Buna-nitrile (also called Buna-N), round in cross-section, has a durometer of 70A, and is designed for use in a wide variety of sealing applications. Buna-nitrile can have high tensile strength, resistance to abrasion, tear, and compression set resistance. It is acceptable for temperature applications between -30 degrees F (-34 degrees C) to 250 degrees F (121 degrees C). It is compatible for use with petroleum, HFA, HFB, and HFC fluids, vegetable oil, alcohol, acids, and aliphatic hydrocarbons. Buna-nitrile is vulnerable to acetone, ethers, esters, ozone, sunlight, and weathering, and should therefore not be used in ozone-generating electric motors, welding equipment, or in applications with exposure to UV light. This O-ring cord has a shore durometer of 70A. Shore durometer is the hardness of a material, and its resistance to permanent indentation. A higher durometer value indicates greater resistance to indentation on a scale of 0 to 100, with 100 indicating no indentation. If you have any questions about this product by Small Parts, contact us by completing and submitting the form below. If you are looking for a specif part number, please include it with your message.